A supernatural thriller in one act. Danielle Upton’s oldest and dearest friend, Edward Derby, has just gotten married to the enigmatic Asenath Waite—the youngest in a long line of occult practitioners. Over time, Danielle notices a change coming over her dear friend. He’s seemingly terrified of his new bride. Sometimes he acts like he’s an entirely different person. 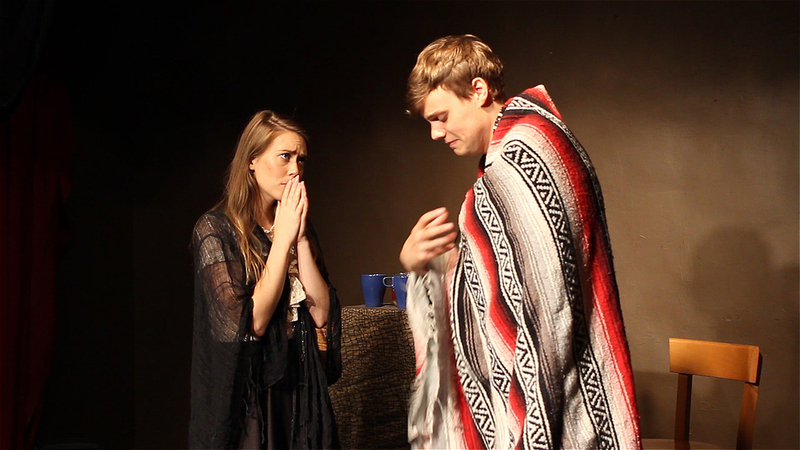 Is poor Edward going insane, or does Asenath hold some mystical sway over him? The answers are revealed in a final, gruesome confrontation that no one escapes unscathed. Set in 1930s in the legend haunted town of Arkham, Massachusetts, and based on the short story by horror legend H.P. Lovecraft, “The Thing on the Doorstep” is a dark trip into the world or the supernatural. Contains adult language; recommended for mature audiences. Danielle Upton – (20s-30s) A strong willed New England woman who is concerned for the wellbeing of her lifelong friend, Edward Derby. Edward Derby – (20s-30s) An eccentric young author with a fascination for the occult and a somewhat childish disposition. Driven to the brink of madness by his wife Asenath. Asenath Waite – (20s-30s) A cold, mysterious woman from a long line of occultists. She has unnatural powers which she uses for toward evil ends that involve her naïve new husband. Winslow – (20s-30s) Danielle’s loving husband; a good-natured man who becomes increasingly concerned that Edward’s behavior may have an adverse effect on his wife. The room is dark. The heavy spatter of RAIN carried on a roaring WIND can be heard outside. The room suddenly illuminates as a bright FLASH pours in through the windows, and thunder EXPLODES outside. An empty crib is visible near the fireplace. There’s an urgent POUNDING at the front door. After several moments, DANIELLE enters, dressed in a nightgown, and goes to the front door. I’m sorry, Danny. I know it’s late. I didn’t know where else to go. She’s gone out. On her own, for once. And I just had to get away. I think one of the servants saw me. They’ll tell Asenath, of course. But I just had to get away. I didn’t know where I was going, but I ended up here. DANIELLE goes to EDWARD and takes hold of his arms, forcing him to stand still. Edward. What’s wrong? Did you and Asenath have a fight? A fight? No, not a fight. We’re closer than ever, actually. Won’t you tell me what’s the matter? Another THUNDER CRASH. EDWARD goes to the window again and looks out. This is some storm we’re having, isn’t it? You know, there wasn’t a cloud in the sky this afternoon. Not as far as the eye could see. And now this storm. Just appeared out of nowhere. As if by magic. DANIELLE takes EDWARD firmly by the hands. Edward. Speak to me. What’s wrong? EDWARD looks long at DANIELLE. I’m afraid, Danny. I’m afraid of her, but I’m more afraid of what you’ll think of me. You’ll think I’m insane. You will. I know you will. Edward, whatever you have to tell me, I’ll believe you. I’ll go put on a pot of tea and get you a towel. And then, when you’re warmed up, we’ll talk. Alright? EDWARD nods. DANIELLE exits. LIGHTNING FLASHES, and EDWARD jolts slightly. He tries to wipe his wet hands off on his dripping clothes, then gives up. Suddenly, he becomes dizzy. His hand goes to his head as he winces in pain. His body shakes with mild spasms as LIGHTNING continues to blaze outside. After a few moments, the strange fit subsides. DANIELLE re-enters with a pair of towels, EDWARD’s back to her. Come over here and sit by the fire before you catch your death. Once you’re dried off, things won’t seem so bleak. Here, now. That’s better. You’ll sleep here tonight, and tomorrow we’ll sort everything out. Of course. You’re my friend. Yes...yes, you’ve always been kind to me. You’re a good person. You deserve some kindness. Come, stand by the fire. DANIELLE takes the second towel away and begins to roll it up. Have I ever told you what a beautiful woman you are? DANIELLE freezes. She looks at EDWARD, and does not speak for a long time. You are. Very, very beautiful. To license this play or for a copy of the full script, go ahead and shoot me a message. Be sure to include the intended performance dates, the location and seating capacity of the venue.